This is a trilogy about three young men finding the fulfillment of their youthful ambitions, from the late 1980s onwards, in rock music and journalism, up to the present day and middle age. As middle age comes on, each must accept a wider responsibility for their past sins. Having either emigrated to or been born in London, all of them become caught up in tantalising opportunities in the capital to fulfill their ambitions of success and fame. Each of them also finds that success comes with an immense price for them personally, and private failures that unmercifully torment them. Their hopeful idealism and dreams become tainted by ruthlessness, opportunism and betrayal of their principles. As each character grows older, he realises he wants to redeem himself and somehow resolve the worst things he has perpetrated in his life - but true redemption requires genuine sacrifice; one even more intense and difficult than their hard-won successes of the past. It may be more than any of them can endure. All of this happens against the background of London's fantastic, fabulous variety and wealth and exoticism, opportunity and glamour, corruption and poverty and loneliness and harshness. Its pitfalls, rewards and insatiable demands as a fast-moving cultural and media capital are a significant part of the novel's tone, with an intensified sense of time and place. 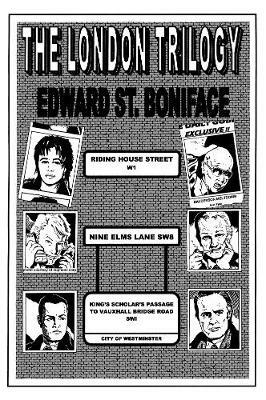 Edward St. Boniface takes inspiration from a wide range of authors, including Ray Bradbury, Mark Z. Danielewski and David Foster Wallace. The London Trilogy is a work of adult contemporary fiction that will appeal to fans of highbrow and literary novels, bildungsromans and satire.